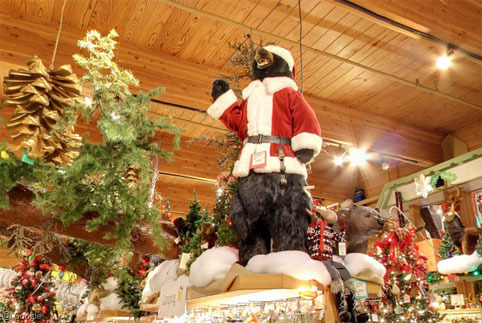 Four years ago we paid a visit to Bronner’s CHRISTmas Wonderland in Frankenmuth, Michigan – the largest Christmas-themed shop in the world. 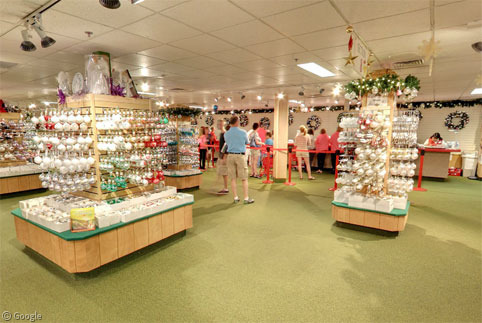 Now we can return for a more detailed look, with Google’s Street View available inside the shop, giving us a close-up look at the rather over-whelming quantities of lights, tinsel and ornaments, as well the over-sized displays found throughout the building. 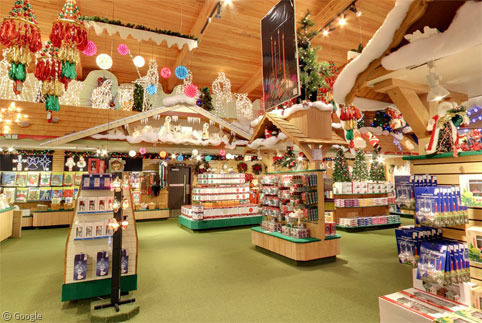 Here at Google Sightseeing we find it a bit mind-boggling that even a small Christmas shop could operate year-round, let alone one this huge. It stocks more than 50,000 individual products in a building almost 30,000 m² in size which attracts over 2 million customers each year, who flock from far and wide1 to this small town (population 5,000) north of Detroit. Navigating such a huge and crowded space on Street View is somewhat tricky (there are 15 different sections inside the shop2) but we’ll show you the highlights. 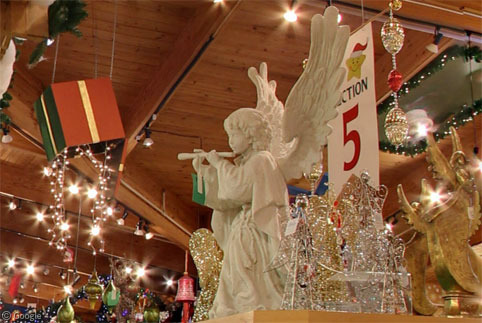 We begin at the south entrance, where there are welcome signs in numerous languages, as well as a giant Santa Claus and a large nativity scene, a reminder that Wally Bronner started the business as a deep expression of his faith. Section 1 has an information desk, immense numbers of Christmas-red shopping baskets (and what appears, confusingly, to be an Easter display). 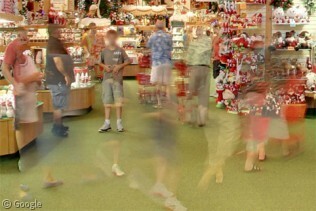 There is also a countdown sign telling you just how urgently you need to complete your Christmas shopping3. 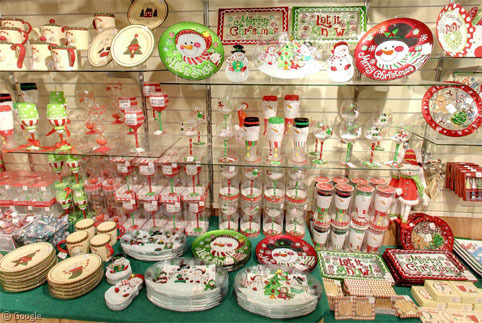 Turning right brings us to Section 4, which is mostly dishware and glasses decorated in endless combinations of Santa, snowmen and Christmas trees. 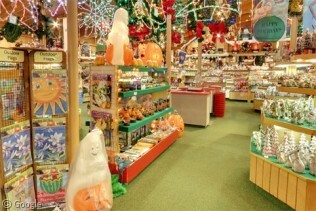 To confuse us even more, Section 3 includes a ‘seasonal’ area, which features Halloween products and illuminated Thanksgiving, Valentines and Easter signs to make us feel as though we’re suddenly in Tim Burton’s Nightmare Before Christmas! We don’t want to worry anybody, but this part of the shop appears to be haunted by several ghosts, and we have no idea what these are, but we find them deeply disturbing. Beating a retreat back to Section 4, we come across life-size reindeer perched on a roof, along with some stern-looking figures. And wind chimes. Pressing on to Section 5, if you’re a Doctor Who fan (see our recent 50th anniversary post) you probably hope this is not a weeping angel. This area’s a bit of a mix, with Santa suits (including slightly creepy mannequin heads modelling wigs and beards), beer steins and glasses, and a wide range of advent calendars. 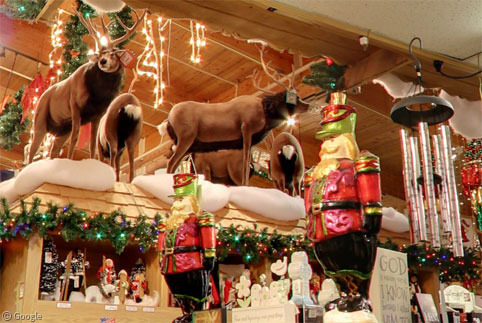 Section 6 has a vast array of nativity scenes, Christmas town buildings, and stockings … for dogs and cats? Section 8 is one of the largest, with countless thousands of ornaments which can be taken to a team of workers for decoration and personalisation. 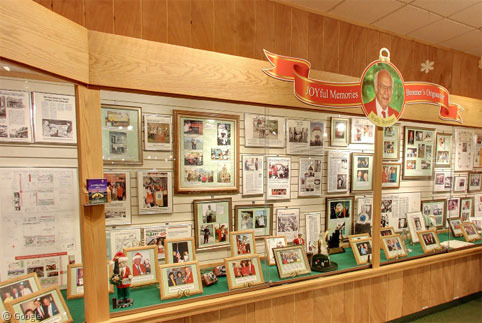 Tucked in the side of this area, Section 7 features the ‘Originator Wally Bronner Display‘ – a large display case with family photographs, and framed newspaper articles tracing the 68-year history of the shop. Section 10 is so large it is subdivided into five different zones with ornaments and decorations for every possible taste, interest, occupation, hobby, pet and sport. Some examples include: alcoholic beverages right next to cowboy/western4, various countries and regions of the world and assorted construction vehicles. 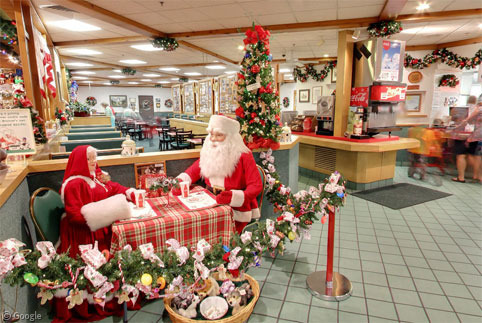 If so much shopping depletes your energy you can refuel with Santa and Mrs Claus at the Season’s Eatings cafe. Models of jolly old Santa can be found wherever you look throughout the store, but this particular one wins the ‘most likely to traumatise small children’ award. 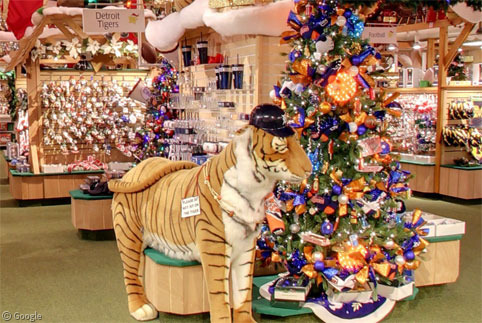 The larger-than-life tiger is slightly less scary, and draws attention to the display full of products licensed from the nearby Major League Baseball team, the Detroit Tigers. Though we notice it is resting its plump belly on the display stand. Perhaps it eats shoplifters? 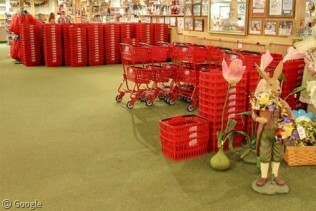 Section 14 has a wide range of artificial trees in natural and … not-so-natural colours. 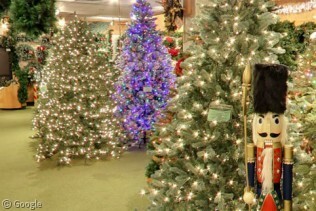 And a photo-bombing nutcracker. And palm trees for those after a bit of tropical paradise in their Christmas. And finally we made it to Section 15 which has hundreds of options for lights and illuminated displays. 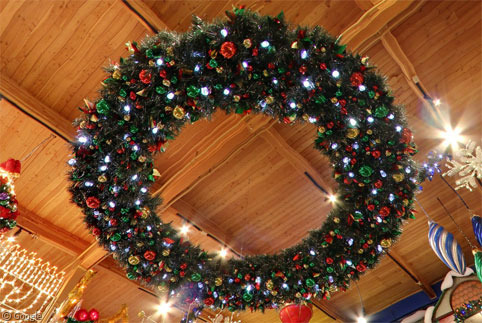 We will end with a look at a giant overhead wreath to celebrate the season. Merry Christmas and happy new year to our readers, from all of us at Google Sightseeing! 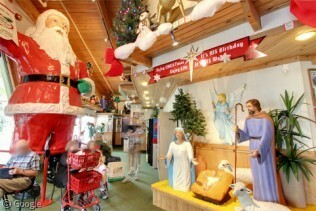 You can learn more at Bronner’s website and Wikipedia. 2012: O Christmas Tree! O Christmas Tree! 2011: Ho Ho Ho! 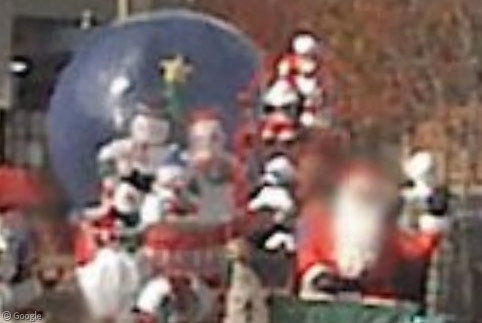 Giant Santas! What with the Weeping Angel you found, this may be the new Doctor’s TARDIS … it’s certainly very big on the inside.